The Fontaine fifth wheel provides the reinforcement you need to safely travel down the road. Fontaine Fifth Wheel is one of the leading fifth wheel manufacturers in the world. Although it is a well-recognized company in North America, South America and Europe, their products are sold all over the world. 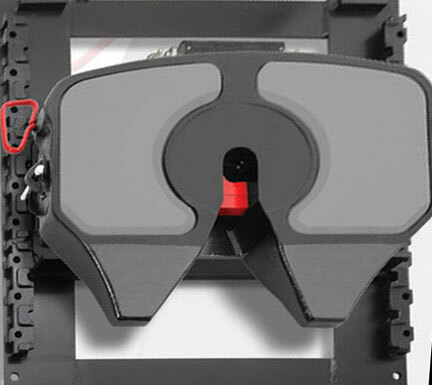 They focus on fifth wheel connecting parts, which are used in turn by manufacturers of the actual fifth wheel campers (Fontaine addresses also the truck industry with its heavy-duty coupling devices).. They are known worldwide as a reliable company that offers safety and comfort for their clients. They manufacture top plates, sliding brackets and stationary brackets. Some of the best models of the top plates manufactured by Fontaine Fifth wheels is the No-Slack NT model, the 7000CC series, the 7000 series, the 6000 series, the H5092 series and the X5092 series. The No-Slack NT model is designed for a 100% highway standard duty, with a patented self-adjusting No-Slack lock. It has a 50,000 pounds vertical load, a 150,000 pounds draw-bar pull and an approximate weight of 228 lbs. When breaking and accelerating, the No-Slack NT model reduces shock inputs into the frame, which makes the ride more safe and comfortable as well. This also extends the life of other components. You can prevent dangerous high-hitching with this model, thanks to its safety trigger that eliminates the possibility of false coupling. It can be switched from trailer to trailer in an easy way. The sliding brackets manufactured by Fontaine Fifth wheel are the LWB air, ATB air, AWB air, ASB air, LWO air, LWI air and the XAWX air. The LWB air slide bracket is light weight, yet it offers a strong performance. It has a steel reinforcement for greater strength, improved fuel economy and a dual durometer two-piece bushing. It will reduce maintenance cost by the greaseless bracket liner that gives a consistent lubrication. This assures that there is no metal to metal contact, therefore the parts last longer. It has an improved payload distribution thanks to the two-inch slide increments. It offers a greater stability thanks to the Quad-Lock four-point locking system. The stationary brackets that you can find from Fontaine are necessary if you want to have more hauling options. The available models are: PMA plate, APB plate, PSA plate, XPSA plate, FMA bracket and BSM bracket. The PMA adjustable plate mount comes with two-inch adjustment increments, new greaseless bracket liners, dual durometer two-piece bushing and computer designed reinforced cast bracket. It has a lighter weight and greater strength thanks to the computer designed components guaranteeing a wide range of hauling requirements. It has an improved shock absorption and better support. The computer designed technology will not let you down and it makes possible to have the same strength with much less weight. You can buy fifth wheel brackets and plates using the web page of Fontaine Fifth wheel. You can do this by choosing the state you live in. The program will give you all the locations where you can buy the parts and components manufactured by this company. They provide address and phone number as well. If you travel with a 5th wheel, you made need some extra help. The Fontaine fifth wheel provides the reinforcement you need to safely travel down the road. You have a choice of the heavy-duty stationary long plate or a regular long plate. Both of these models have different types of dimensions and weight specifications. You would not want to put a 33 ft 5th wheel on a long plate that is only rated for a twenty-three foot camper trailer. When you do buy the long plate you need to keep in mind the year of your 5th wheel and truck. If you have 1982 truck and a 1994 fifth wheel, you want to check to make sure the long plate is compatible with both in dimensions and weight capabilities. Another thing to make sure if you order online or buy the part in a store, you will need the dash installation kit as well. Some places may sell this separately. Once you get home or receive it in the mail, you are stuck without the kit. I know a person in New Jersey that did just this. He had to wait to receive the kit in the mail. The Fontaine fifth wheel long plate is made durable and for the type and weight of the 5th wheel you will be towing. A person out in New Hampshire not to long ago, bought a left side opening and had to return it for a right side opening, which worked much better for him and his fifth wheel. You can also choose from other long plates such as the air wedge, blocked, manual wedge and the angle mount. There are many different styles when you look at a Fontaine long plate. You always need the right equipment when you own a fifth wheel camper trailer.